Valvoline manufactures synthetic lubricants and additives, including motor oils, gear oils, greases, anti-freeze, automatic transmission and others. Valvoline is the approved supplier of engine oil to Cummins. 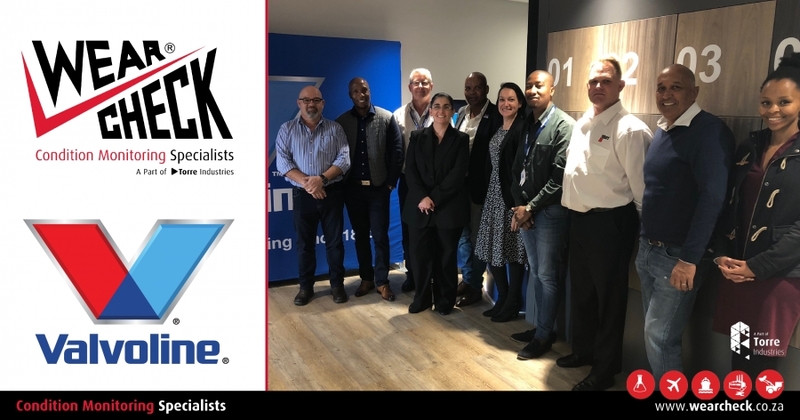 WearCheck is proud to announce that we have signed a partnership agreement with Valvoline to do their oil analysis in Africa and the Middle East. Lubrication specialists Valvoline sent a team for condition monitoring training with WearCheck’s technical manager Steven Lumley (fourth from left). Also on this course was a team from Fleetgard, a division of Cummins that supplies filtration for Valvoline.